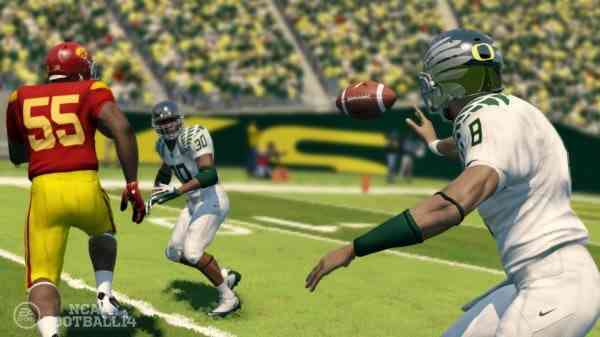 EA Sports’ NCAA Football franchise has always been regarded as Madden’s little brother. Sure, it is a very good football series in and of itself; yet at the end of the day NCAA has always been considered a stopgap option until Madden comes out later in the summer. Throughout the years however the franchise has made some steady gains which are reflected in positive review scores and some strong sales. Last year NCAA 13 was a solid game but I felt it did not offer “enough new” to justify the $60 dollar plunge. This year I find myself in a position where I am looking for big changes. I want a silky smooth gridiron experience to go along with a glut of features that typically comes with EA Sports football games. Did I get all that and a bag of chips? I sure did, but before you start planning the NCAA 14 victory parade there is still some room for growth and there were some issues I encountered that managed to “grind my gears”. All the new bells and whistles aside, when it comes to any football game the gameplay is the most critical component and it is here where I firmly believe that EA’s college football franchise has taken a step in the right direction. For starters, ‘Total Control Passing’ is back and has been fine-tuned. The ability to pass lead receivers with pinpoint accuracy once again feels great. In fact it feels even better this year. When I say fine-tuned, I mean the passing mechanic has been toned down a bit. For instance, pass leading the Tight Ends on streaks down the field is a lot tougher this year. The coverage is tighter and the pass lead is not so pronounced. Bottom line, it feels much more balanced and truer to life. The running game has also seen a big upgrade. Running Backs (RB) can now make sharp cuts and the blocking has been improved. You’ll find that RBs now have more moves at their disposal with your ability to use the buttons and right thumb stick for performing stiff arms, hurdling defenders, quarter turns, juke moves, etc. On the downside the RBs feel heavier and almost a little more sluggish this time around. They seem to be missing that breakaway speed, as defenders are able to catch up to many backs that appear to be breaking away. That being said, the ability to hit holes and move your RB exactly the way you want him to move is pretty cool. Not to mention the Triple Option and Shovel Option plays make the running game much more dangerous this year. Being able to accurately read the Defensive End and making the right decision on an Option play will likely go a long ways towards your success online. If you plan to play NCAA 14 online this year you will want to spend some time in the NIKE Skills Trainer area where you can work on all those new option plays and pitches and work on the various new running controls. On the Defensive side of the ball, I don’t see much of a change from what I experienced. 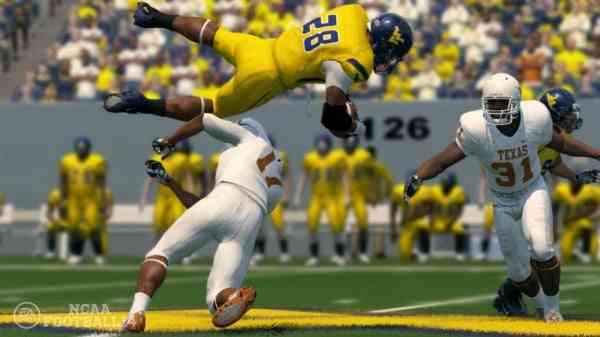 The Ball Hawk feature from Madden 13 is included making interceptions a little easier compared to previous NCAA games. This feature is triggered by simply holding the Y button for the closest defender to where the ball is in the air and he will attempt to pick off the ball. 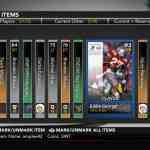 It’s a great feature but something that takes a bit of time to master, yet for Madden 13 veterans you will have no problems whatsoever. 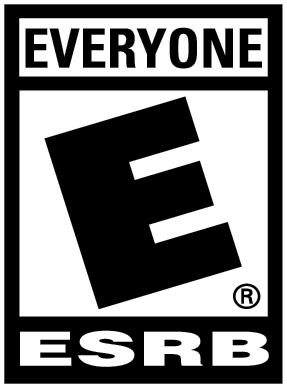 The Infinity Engine 2 gets a huge chunk of the credit when it comes to how NCAA 14 plays compared to previous entries. Last year we saw RBs flop to the ground just by bumping into their Offensive Lineman. There was no ability to push off your Lineman or recover when you started to stumble. 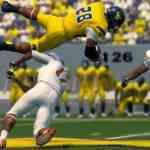 This year NCAA 14 includes a Force Impact System where speed, momentum, and mass are all taken into account in a collision. You can now recover from your stumbles and push off your lineman. The result is a game that is a little more unpredictable. Granted, I did see many hits, tackles and collisions that looked similar to one another, but compared to last year’s game I did feel like I was more in control. The only strange thing I saw a little too frequently occurred during a gang tackle. In a few of these instances the ball carrier would sit on top of a defender and the whistle would not blow. By all accounts he was down by contact, yet the play continued. It happened on a few occasions and seemed like a bit of glitch. It is not a deal breaker by any means but something I did notice a little too often. 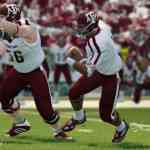 Other items that impacted my NCAA 14 gameplay experiences have to do with pre-snap adjustments. These adjustments are no longer accomplished with just the d-pad. Last year I loved being able to strictly use the d-pad to place say my Defensive Line on a hook zone or place my Wide Receiver on a zig route. This year some of the adjustments have been mapped-out to the controller’s buttons and it takes some getting used to, at least I find it that way. Simply put, I prefer the Madden 13 pre-snap controls. Likewise, calling an audible is taking some getting used to as well. I am sure with more time spent with the game I will break my Madden 13 habits, but for now I have to admit I am not a fan of the new pre-snap adjustments control scheme. Presentation wise, NCAA 14 is pretty darn good and I do like how they went with the metro-like menu system. It is easy to navigate, very colourful, and modern looking. Additionally, there are new cut-scene vignettes/sequences and new on-field chatter. There are some new camera angles as well. All in all, the development team managed to effectively deliver that energetic college football feeling to the game. 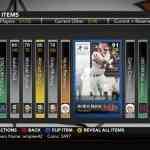 In terms of the various games modes, Ultimate Team and Dynasty mode return. 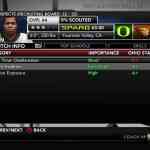 Both modes see some new features and will likely be welcomed by the NCAA football community. I am just amazed at how much goes into these modes and how incredibly deep they are. The new Coach Skills feature alone gives the Dynasty mode a RPG-like progression system. Likewise the Power Recruiting feature streamlines the recruiting process without cutting any of the depth or detail fans have come to expect. Without going into any further detail let’s just say there is plenty to offer with both of these modes and I have all the confidence that those who pick up the game for either of these modes will not be disappointed. For those of you like me who are not interested in recruiting or earning XP, NCAA 14 offers up a Season mode. Here you can pick your favourite team (Go Huskies!) and run through an entire 2013 season. This mode features full play by play with Brad and Kirk. Rece Davis also provides some of the around the college football world updates. For the more casual NCAA fans like myself, who are not big into things like scouting, pitch grades, and recruiting enhancements, the Season mode should be right up your alley. I am all about playing my weekly match-ups with my beloved Washington Huskies and this is what the Season Mode allows for. On its own, NCAA 14 is a sharp looking game but I have to admit since I had a look at the next generation Madden 25 visuals at E3 a couple of weeks ago I am left a little underwhelmed. Madden 25 looked absolutely stunning, but I also recognize the developers can only do so much with the limitation of the Xbox 360’s hardware. 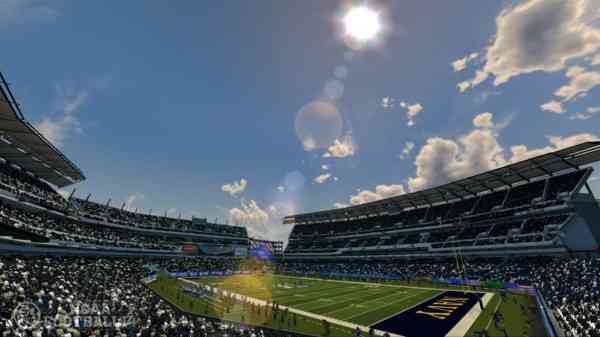 This said the lighting effects in NCAA 14, which create the natural progression of sun and clouds across the sky, are pretty darn impressive. The stadiums look fantastic and the surrounding areas look exactly like their real-world counterparts. In-game player animations are sharp too as the players move and react better than ever. Some of those leaping grabs and ankle tackles are bang-on. 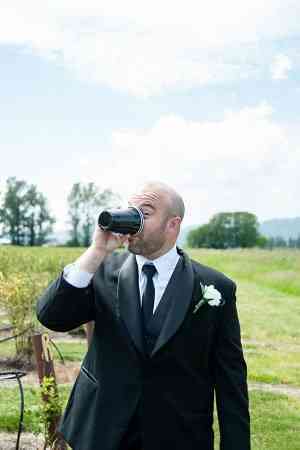 The sideline team shots however could have looked a little sharper and likewise the fans lacked some serious detail. 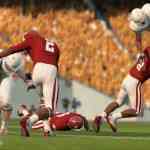 On the bright side, some of the clipping issues from NCAA 13 appear to be gone this year. 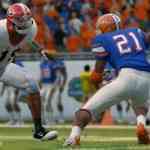 As far as the sound is concerned, NCAA Football 14 delivers. This being said, some of the commentary felt a little too familiar and many of the one-liners were directly taken from last year’s game. 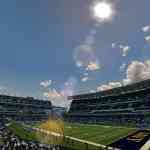 Nevertheless, the developers managed to duplicate that college football feeling to near perfection. Likewise being able to hear “Seven Nation Army” and “Kernkraft 400” during kickoff and punt returns was pretty slick. 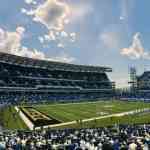 From the authentic commentary by Brad Nessler and Kirk Herbstreit, to each school’s marching band, NCAA Football 14 is a game full of energy and much of that energy comes from the sound department. When you compare NCAA Football 14 with last year’s game there is no question the franchise has moved forward in the right direction. The enhanced running game, new physics driven animations, and the re-engineered spread and read option game make for an unparalleled NCAA football experience. While I still see room for growth, and in many ways the virtual college ball game comes across as an appetizer before the full meal deal that is Madden 25 arrives next month, the fact remains NCAA Football 14 is about the best college football game we have seen to date. Previous Deadpool (PS3) Review – Guns n’ Swords n’ Cuss Words… OH MY!